Collagen Facial is a top of the range treatment during which the collagen molecules penetrate into your skin to retard ageing, recover loss of firmness/elasticity, even color tone, enhance moisture level, oxygenate, oxidize and protect natural skin collagen. In just one treatment your skin can look younger and suppler. 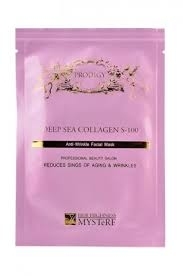 Collagen Mask improves your skin elasticity and adds moisture for nourishment. This formula will implement to your face and make your skin more soft and radiant. Helps to accelerate collagen synthesis and elastin collagen thickening, encourage skin renewal and reduce skin muscle contraction. Collagen Mask gives our skin the fresh look from the salon facials. Reduces signs of aging and wrinkles and gives skin a youthful appearance.